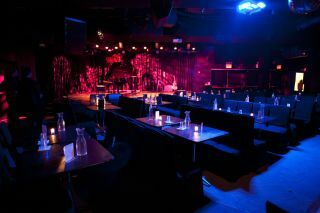 Celebrating its 10th Anniversary, the music venue and multimedia art cabaret (Le) Poisson Rouge (LPR) in the heart of Greenwich Village on the former site of the Village Gate is already legendary for its unique and eclectic synthesis of popular and creative culture in emerging music, theatre, film, and fine art. With “a mission to establish a creative asylum for both artists and audiences,” LPR’s performance spaces are designed to be highly adaptable in terms of seated, standing, in the round, and other audience configurations depending on the artist, type of music, format, visual elements, and level of immersion. Considering the eclectic lineup of musicians, writers, and composers who’ve appeared at LPR in recent years—which includes Lady Gaga, Yo-Yo Ma, Philip Glass, Iggy & The Stooges, Mumford & Sons, Kings of Leon, Norah Jones, Beck, Lorde, Salman Rushdie, The Shins, and more—maximum flexibility had to be an integral part of the genetic code of LPR’s sound system. During a recent redesign and upgrade of the sound system by Martin Audio’s partner, Frost Productions, led and engineered by Frost’s installation project manager Jose Lima in collaboration with LPR’s production director Jay Eigenmann, the theater has achieved the degree of versatility for it sought. Audio quality first and foremost was a given; in this regard, Martin Audio was handpicked by Eigenmann, Bernie Girman, LPR’s production coordinator, and David Handler, co-founder, after auditioning a host of products at InfoComm 2017. The new system employs a full complement of Martin Audio that includes a Wavefront Precision Compact array, CDD, CDD-LIVE, CSX-LIVE, and SX218/SX118 subwoofers, XE300 monitors, and iKON power amplifiers, networked via a Dante system in a design creative enough to match the demands of any artist or performance. The main space is a 700-capacity flexible performance area standing (350 capacity seated, with standing room at the bar and around the perimeter). Asked to specify the challenges implicit in LPR’s layout, Lima said: “The main space is an asymmetric shape with the corner stage diagonal to the room and low ceilings. There’s an irregular ceiling with HVAC conduits running across the room with one in front of the house-right hang, and one behind the house-left hang. There’s also a hollow, circular dance floor, and a stage made of steel deck modules. That, plus we had a very short turnover time, with the installation completed in four days, from taking down the old system to the first show. This required the crew to work around the clock to get it done in time." In the main room, the system starts with a PA hang for the corner stage with four Martin Audio WPC a side in two-box resolution and a CDD-LIVE 15 as center hang/downfill with five SX218 subs across the underside of the stage. For in-the-round performances, the system used to consist of four multipurpose speakers that had to be hung manually every time out, and according to Eigenmann, “didn’t provide the firepower or coverage to do more aggressive shows. They were ok for quiet jazz shows and acoustic performances, but LPR does everything from spoken word or solo piano recitals all the way up to death metal, EDM, and everything in between. Basically, anything you can imagine we’ve probably had and we wanted our in the round PA to be able to handle the same breadth and scope as our main PA.
“Now the system has evolved to feature a permanently flown ring of six CDD-LIVE 15s in a 360-degree configuration around the 16-foot diameter center stage that not only eliminates having to hang the speakers every time we go in the round, but also provides much more power and impact. The CDD-LIVE waveguide technology allows us to get even coverage throughout the room. With the additional horsepower to do those more aggressive shows, we’re able to take on almost any sonic challenge in the round. The smaller Gallery Bar performance space is equipped with Martin Audio CDDs, all powered by a single iK81 power amp. The main left/right hangs are a pair of CDD12s in front of the modular stage (which is made up of three four-by-eight decks) at the northwest corner of the room but can be moved based on the artist or type of performance. A delay pair of CDD10s can be either turned in line with the mains as true delays or turned inward for an immersive dance party experience. Also, two CDD10s flown by the stage can be used as side fills, or left right when the stage is removed as reinforcement for dance parties or all-immersive events. There are also three CSX112 subwoofers to support the CDDs built into the soffits under the tables with banquettes along the wall across from the bar. A pair of elf-powered CSX-LIVE 118s can be put on the ground directly under the mains and patched into the wall via Dante as full-range mains for concerts. They can also be stacked for dance parties to additional low-end support or taken into the main space for use as utility subs with subs in conjunction with the four SX118s, for something like an electronic in-the-round show with six single 18s under the stage to match the flown CDD-LIVE 15s. “The main room has three CDD-LIVE 12s used as out fills,” Eigenmann said. “One is for the raised VIP opera box section, and two are used as bar fills. And there’s a CDD10 above the house right rig to cover an area off the stage where a lot of folks stand, which had never been covered until now, so that’s exciting. We also have a pair of CDD-LIVE 8s as stereo near fields at FOH for our staff and guest engineers as it’s traditionally been different up top at the mix position than on the ground in the house. “You don't need audiophile ears to recognize a tremendous improvement with the new system right away,” said Justin Kantor, co-founder, director of operations, and classical music director of LPR.